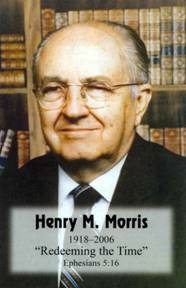 On February 25th, at the age of 87, Dr. Henry Morris went to be with the Lord. He leaves behind a legacy worth taking a moment to remember. I believe Dr. Henry Morris is rightly referred to as the father of the modern creation movement. His book, The Genesis Flood, co-authored by John Whitcomb and published in 1961, is seen by most as the starting point of providing a much needed response to the evolutionary thinking dominating our culture. His works include more than sixty books, most dealing with the subject of Biblical and scientific evidences for the Biblical view of creation. He was the founder of the Institute of Creation Research, one of the leading (if not the leading) organizations actively undertaking research in line with the Biblical view of origins. He was a man who properly understood that evolution’s lies were the greatest satanic attack on the authority of the Word of God, and he put his energies towards exposing this lie. He leaves behind children who are actively serving in Christian ministry. His son and current president of the Institute for Creation Research, Dr. John Morris, testifies of his father that he was the best Christian that he knew. I met Dr. Henry Morris only once, but this short meeting made a lasting impression on me. It was during my schooling at ICR, the summer of 2004. I found his office and knocked on the door without any answer. Disappointed he was not there, I was just about to leave when I heard a couple approaching. I turned and watched as he slowly made his way up the stairs with his wife. We exchanged greetings and shared a few words about ICR, but the memory that stuck in my mind was watching someone of his age struggle up the stairs, knowing he was still actively serving the Lord. I remember hearing a sermon stating that it is not how well you start in your Christian walk, as much as, how well you finish. Well, I hope and pray that I will finish as well as Dr. Henry Morris finished. Also, speaking of finishing, I would like to finish with the following quote from Dr. Morris himself.